5 November 2008, at 11:05p.m. GERMANY - Big Dutchman has won a Gold Medal at the product preview competition for EuroTier for its 100% accurate egg count with innovative camera technology - EggCam. Finally, unreliable egg counters are a thing of the past: Big Dutchman has developed a system that uses state-of-the-art camera technology to take a picture of every egg in the barn. For the first time ever it is now possible to achieve 100% counting accuracy. The unique feature of this innovation, says Big Dutchman, is that the EggCam records both the egg weight and the egg quality. 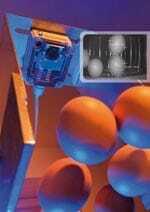 In the forerun of EuroTier 2008, a commission of experts has therefore awarded the EggCam with the coveted EuroTier Innovations Gold Medal. This completely new egg counting system comprises an image processing technology integrated in a sensor. "This way, the eggs are continuously registered and accurately counted" explains product manager Christian Kalkhoff. Furthermore, the innovative system checks the eggs for dirt on the surface already in the barn and, at the same time, measures the eggs and assigns them to different weight categories.